This tiny joint is a Portland institution; wedged in between Mary's and Tugboat, right across from Bailey's. You can have yourself a fine little night without ever leaving this block! It's generally jam packed, blasting metal music, and ill staffed- but just shut up and enjoy it! Impress your out-of-town friends with a true Portland experience. Enjoy the company of burnt out bums and strung out strippers whilst consuming a massive burrito attack! Don't forget to use the bathroom while you're here, as it is shared with Mary's. You sneaky little devil, you. If you're really bad, they'll deliver your food to you at Mary's, so you can get off in more ways than one! If you're well groomed and boring, they'll deliver it to you at Bailey's. Here's a link to their MENU. Ingredients: Pinto beans, rice, relleno, pico, guacamole sauce. Smothered in verde sauce, cheese, sour cream. This sucker is the most expensive burrito I've reviewed on my blog so far. Especially when you add in the strong $7 margarita you'll no doubt order as well! So, it's not a cheap date... so what? 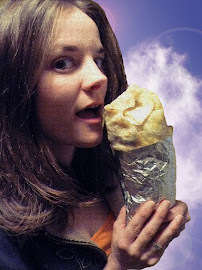 It's also the largest burrito I've reviewed thus far, about the size of a small/medium child. Almost as wide as it is long. I was so eager to delve into this brute, that I nearly burnt my tongue off! HOT STUFF! The flavors weren't super titillating (perhaps because of my scorched taste buds), but a little hot sauce brought it up a notch or two. Getting it smothered added an exciting, saucy dimension. The relleno was scrumptious, though it was hidden deep within the burrito body. I had to make my way through a stockpile of meh rice and beans before hitting the pleasurable treasure trove. I was surprised with myself as I kept shoveling the monster down my gullet, without swelling up and passing out. Then, towards the end, it hit me! Burritoed-out-stonedness. No need to purchase street drugs outside the door, just finish off one of these bountiful beasts and stumble on home; eyes aglow with the night's shenanigans.